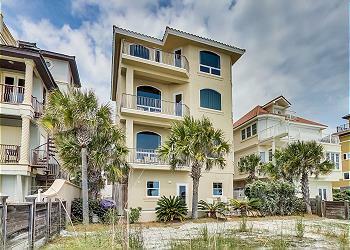 DETAILS: A stunning beachfront home in the prestigious Dunes of Destin gated community! This incredible home offers four levels, 6 bedrooms, 6.5 bathrooms, and beautiful accommodations for 18 guests. The first floor presents the first living room, which offers a comfortable queen sleeper sofa and a large, flat-screen television. Guests in this area can access the nearby full bath. On the second level, a spacious, open layout joins the living, dining, and kitchen areas. The large kitchen boasts granite countertops, ample storage space, and exquisite ocean views. The nearby dining area provides seating for 8 guests, with additional seats at the breakfast bar. Relaxation awaits in the luxurious living room, where a plush queen sleeper sofa and a large, mounted flat-screen television invite guests in. The second-floor media room serves as another spacious and comfortable place for guests to unwind. Two guest bedrooms await on the third floor. The stunning master suite features incredible coastal views and a beautiful king bed. The private en suite bathroom boasts a large soaking tub and a separate shower. Also on this floor is a lovely queen bed guestroom and private bathroom with a shower. The fourth floor features a variety of guestroom accommodations. The first bunk room offers a twin-over-twin bunk bed with a twin trundle and a shared bathroom with a shower. The second bunkroom has a twin-over-double bunk bed with a twin trundle, a separate twin bed, and a shared bathroom. The queen bed guestroom offers a private bathroom with a shower, and the luxurious fourth-floor master suite boasts an elegant king bed and private en suite bathroom with a shower and separate spa tub. Splash in the refreshing waters of the home’s private pool or spend a day on the sugar white sand beach via the home’s private beach access. 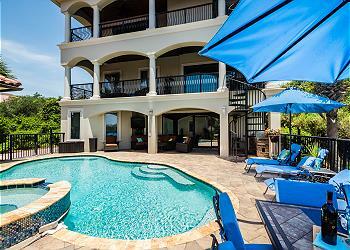 Guests in this home can also enjoy the beautiful, exclusive community pool. Six custom 360 Blue adult beachcruiser bikes offer the perfect, breezy way to explore all that Destin has to offer. 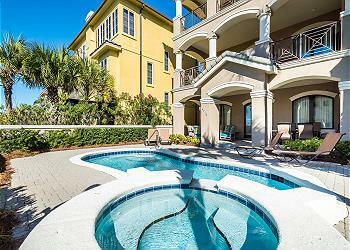 Destin’s famous coastal emerald waters beckon you for your dream getaway. Don’t miss out on this incredible home! Book your stay today by contacting 360 Blue!